Below is our latest glossary for 2019. This glossary has been put together by multiple experienced bookkeeping experts. If you have a suggestion or would like to contribute tweet us at @AlexilumConnect or get in contact. If you are looking for bookkeeping advice for your business or organisation contact us now. You can browse the bookkeeping glossary below or filter it alphabetically by clicking on the alphabet character. This is like a label that is applied to your financial transaction to describe what it is and to make it easy to summarise. For example if you buy pens and paper we might allocate that to the Stationary expense account or when you sell your services we might allocate that to a Consultancy sales account. The individual accounts are categorised as Income, Cost of Goods Sold, Expenses, Assets, Liabilities or Equity. While Accounting can incorporate Bookkeeping generally it's that next step further where the focus is on tax advice and tax minimisation which explains why Accountants charge a lot more than Bookkeepers do. Generally we break up our financial reporting into set periods of time. As a minimum your financial records will be broken up into Financial Years because that's the period that your tax return will cover. Some other Government Reporting has other set periods that might be Quarterly or Monthly. Money owed to suppliers for goods or services including stock and equipment. Also see creditor. Money owed from customers generally from sales made for your goods or services. Also see debtor. Things purchases by a business. A report provided to the Tax Office. There are two types the Business Activity Statement and the Instalment Activity Statement. Represents anything that is owned by the business. This can include both tangible things like cash, accounts receivable, stock, equipment, furniture etc and intangible things like trademarks, client lists etc. See also Balance Sheet. A detailed analysis by a special type of accountant to determine both the accuracy of your businesses financial records and also that the methodology (ie Double Entry Accounting) is accurate. While a lot of people make this out to be a big scary thing it's a standard process by the Tax Office that is not unusual to occur from time to time. These are sales you've made but won't get paid for. Once you've decided there is no chance that you'll get the money out of that customer you can write off those invoices as bad debts so you don't have to pay tax on those sales. A report that reflects the financial position of a business at a point in time. The report is broken up into three key areas: Assets, Liabilities and Equity. The process of comparing the bank transactions in your Bookkeeping System against your Bank Statement. This is a great way to find any Transactions you've missed entering. A report from your bank listing all of your deposits and withdrawals. This is an important document for your Bank Reconciliation. The process of depositing any cash or cheques to your bank account. A report that you send to the tax office on a regular basis. This report can only be prepared by a registered BAS Agent or Tax Agent and shows information like the sales made, GST Collected and GST paid for a given period. It can also change for different information and may also include things like PAYG and PAYGW. Also see Activity Statement. Where you invoice your customers for sales made to them. This is the process of recording your businesses financial transactions with the goal of making them organised in an efficient and accessible way for reporting and future reference. A program like Xero, MYOB and Quickbooks that is used to record your businesses financial transactions. Because they are purpose built to handle this they have a lot of built in functionality to make this process more accurate and can save a lot of time compiling reports. A process to create a financial plan estimating the amount of income and expenses that will occur in the future. Once complete the budget can be used to not only compare against your actual performance but to also help make key business decisions. The funds provided to the business by an owner or shareholder. When you sell a Fixed Asset for more than what you paid for it. This describes the amount of actual money coming in from sales (or other activities) or going out for purchases etc. Cash is king in any business, if you are making sales but you haven't been paid yet then you could find yourself in trouble. This is the final figure for an Account at a given point in time. For example the closing balance on your Bank Statement could be the balance of the account at the end of the month. An Asset that you put up for a lender to take if you Default on your Loan repayments. Let's say you have a Customer that has also provided you with a service so they become a Supplier as well. If they owe you $1,000 and you owe them $750 you could contra the difference and they just pay you $250 to save you both paying each other which might also save on bank fees. This is very common in international transactions. When you are moving to a new Bookkeeping System we enter the balances of each of the Accounts like a summary of all of the transaction that happened to date. By entering a conversion balance you don't have to go through and re-enter all of your old transactions which is not only time consuming but may be unnecessary. This is a type of expense that represents those costs that are directly related to generating income in your business. Generally this is used when you buy 'goods' or a physical item to then resell. So when I pay for my 'goods' that is a cost of goods sold expense. Also see Profit & Loss Statement. This is like a negative invoice that reduces or cancels out the original Invoice. This can refer to either credit notes provided to a customer to partially or fully refund them for a sale or from a supplier where they are refunding an invoice they sent to you. Someone who is owed money by your business. Also see accounts payable. This is a technical term that is part of what we call double entry accounting and forms the basis of the standard of how financial transactions are recorded. The Credit refers to half of a Journal entry. Also see Debit. This is a subset of Assets that have a high Liquidity and can be easily converted to cash. This is a subset of Liabilities and generally represents short term liabilities or those that will generally be paid off in the current Financial Year. Someone who buys goods or services from your business. This is a technical term that is part of what we call double entry accounting and forms the basis of the standard of how financial transactions are recorded. The Debit refers to half of a Journal entry. Also see Credit. Someone who owes your business money. Also see accounts receivable. When you haven't made your loan repayment on time. Cash or Cheques banked to your bank account. This is an accounting method to determine the financial aging of assets that your business owns. For example if you buy a new car for $50,000 it won't be worth that in three years’ time, so that drop in value is called depreciation. The Australian Tax Office has determined that not all assets that you buy can be claimed as an expense up front, and so you have to depreciate it over a number of years. The period that an item has to be depreciated over is determined by the ATO. When part of a company's profits are given to shareholders. This is a technical term that describes the basis of the standard of how financial transactions are recorded. Generally this means any money that an Owner takes from the business. Sometimes you'll see this as an Account. A common Accounting Period when the accounts are Reconciled and Financial Reports are generated. This represents the net financial position of the business. It some ways it could be seen as what the business owes to its owners which is why it's sometimes referred to as Owners Equity. Equity is calculated as Assets - Liabilities = Equity. Also see Balance Sheet. Expenses are costs which need to be paid out to run your business. Expenses are broken into two categories, Cost of Goods Sold and Overheads though it's not uncommon that overheads are just called Expenses on your financial reports. Also see Profit and Loss Statement. A set of core financial reports generally made up of the Profit & Loss, Balance Sheet and Cash Flow. Generally running from June to July the following year in Australia (though it is possible to have different 12 month periods) this is your Accounting Period that your Tax will be calculated on by the tax office. These are long term Assets with a low Liquidity like buildings, vehicles, equipment etc. Generally overheads that need to be paid regardless of how many sales you are making ie rent and subscriptions. See also Variable Costs. This is a technical term that represents where all of your journals are summarised and is the basis of all financial reporting. This is an end user or consumer tax paid on most goods and services in Australia. When selling a business this is the difference between the selling price and the value of the Assets that the business owns. The amount of money made before considering general expenses or Overheads. Generally this is represented by Income less Cost of Goods Sold. A report that you send to the tax office on a regular basis. This report can only be prepared by a registered BAS Agent or Tax Agent and shows information like PAYG and PAYGW for a given period. It can also change for different information and may also include other items. Also see Activity Statement. Money that comes from sales made. Basically this is the cost of borrowing money whether that is as a traditional loan, a lease or a mortgage. If you buy goods to sell again, those ones that you've bought but not yet sold is your inventory. Because it's something your business owns it is called an Asset. Money used to generate a profit. This could be a direct investment in things like shares or property or it could be an indirect investment like new equipment for a business so it can run more efficiently with the intention of achieving higher profitability. A document that has the details of a sale on it. This could be an invoice that you provide to a customer for a sale you made or from a supplier for a sale they made to you. This is a technical term that represents a financial transaction. Accounting standards and systems determine how we should store financial information including the structure of the journal entry. You can think of this more as how your financial transactions are stored in the 'back end' as programs like Xero, MYOB and Quickbooks generally hide this from users for simplicities sake. A contract for a type of loan allowing you to use an Asset without paying for it up front. You may also have the option of owning that item through a Residual payment at the end of the lease term. This is a technical term that describes where the Journals are stored. Represents anything that the business owes to others like accounts payables, loans from banks, unpaid superannuation and taxes etc. See also Balance Sheet. The process of converting Assets to cash. Also see Liquidity. How easily an Asset can be sold or converted into cash. Money borrowed from someone else like a bank. Generally you will pay Interest as a cost for borrowing that money. The amount of money you add to your cost price of a good that you sell. Sometimes mixed up with a Margin but it's from a different perspective. A well known Bookkeeping System in Australia. Where you have more expenses than income in your Business. Where you have more income than expenses in your business. This is similar to Working Capital except you exclude all cash items from the calculation. When looking at Account transactions rather than going through every single one over its history we may just start with an Opening Balance that represents those historical transactions to that date. A type of short term loan that allows you to spend more money than you have in your bank account. Generally when you apply for an overdraft facility there will be a set amount you can take out. Ongoing business Expenses that are not related to direct costs like Cost of Goods Sold. This represents the amount of tax paid in advance to the tax office on behalf of the business to go towards their next tax bill. This is generally calculated on your BAS. This represents the amount of tax you withhold from an employee's pay to give to the tax office on their behalf. Amounts that need to be paid. Also see Accounts Payable. A company or individual who you will be paying. This is the process of how a business pays its employees. This only describes payroll at a very high level as there are many steps to doing payroll. Cash kept within the business to pay for incidental expenses ie milk, coffee etc. Another term for recording a Transaction. A financial report that represents the businesses financial performance over a period of time. It's broken into three main areas including Income (sometimes called Revenue), Cost of Goods Sold and Expenses with the net result showing either a profit or loss. Also called an Income Statement. Generally calculated as a percentage that is the difference between your selling price and buying price for goods. Sometimes mixed up with a Mark-Up but it’s from a different perspective. A written confirmation that you've received payment from a customer, sometimes showing additional charges as part of that payment ie EFTPOS transaction fees. A process of checking or validating financial transactions to make sure they are correct. This could also be called a Reconciliation. When you pay back a Customer after being overpaid or if you have provided a Customer with a Credit Note after they paid the original invoice. When you pay back an employee after they've paid for something on behalf of the business. A written document that notifies a supplier that a payment has been made. This is especially helpful if you are paying multiple invoices in the one payment so they know which ones have been paid. Sometimes called a balloon payment this is a lump sum amount that needs to be paid at the end of a lease to actually buy out the equipment. The Net Profit you will get back on an Investment. Money collected (or promised) for the sale of your goods or services. Also see Profit & Loss Statement. A fixed amount of pay (generally per year) rather than based on the hours worked by an employee. Also see Payroll. The best part of being in business, when someone is willing to pay you to provide them with a good or service. Note that the sale is only the first part; you still need to get paid which is the Income part. 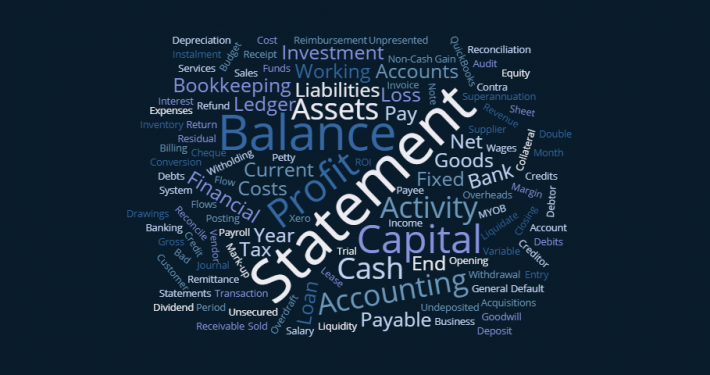 A Financial Statement that reports on the cash coming in and going out of the business. This report is often undervalued but can be much more important that the Profit & Loss. Also see Cash Flow. A Government mandated entitlement for employees in Australia to invest a portion of their Wages with the purposes of supporting their living expenses after retiring. Someone who you buy goods or services from. Funds paid to the Government, generally calculated based on your Net Profit. This is basically when you record a financial event ie you made a Sale or paid for an Expense. Also see Journals. This is a technical report used to double check the accuracy of the journals that have been entered into the bookkeeping system. Money that you've received but haven't banked yet. This is a cheque that you've received but haven't banked yet. A type of loan that does not have any Collateral. Costs that can vary depending on the amount of sales you make. See also Fixed Costs. The cost of engaging an employee, basically what you pay them for their time. Money taken from your bank account. Calculated by your Current Assets less your Current Liabilities this represents how easily your business will be able to service or pay off your debts. Generally we're talking about the end of the Financial Year. This is an important reporting period as it will form the basis of any Taxes you have to pay.